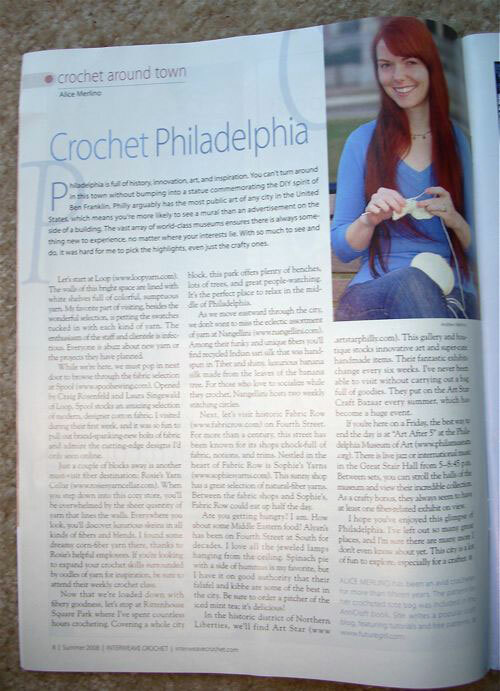 I'm so excited to tell you about the article I wrote for Interweave Crochet Summer 2008 Issue! They have a reoccurring column called "Crochet Around Town" that focuses on the crafty/crochet/fun spots in a certain city. In the last issue Vickie Howell wrote a great piece about Austin. 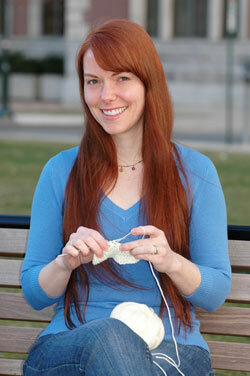 I almost exploded when Interweave emailed me and asked me to write a tour of crafty Philadelphia. Andrew took this wonderful picture of me in MARCH. I knew it was going to be published in the summer issue, so I tried to look summery. It was 41 degrees outside when we did our photo shoot in the park, and I could barely feel my fingers. My winter coat is sitting on the bench just out of frame. Even so, the photo came out great! Thanks, Andrew! If I remember correctly, this article took every spare moment I had for a week. (Which hopefully says more about my lack of free time than my writing abilities.) That means I could write a 52 page book in a year ... with no time off, no movies, no concerts, and no *crafting*. And 52 pages isn't much of a book, either. Writing a book is more daunting that it seemed back in December. Not un-doable, just daunting-er. And now I have even more respect for how much work goes into craft books. Well, any book, really. So, if you feel like crafting it up in Philly, check out my article. Or, if you're like me, you can walk around with the magazine open to my article and periodically point at my picture and say, "Hey, I know her!" And, of course, the magazine rocks. I've been thinking of making a loopy bath mat forever, and there's a cute pattern for one with great tips for getting uniformly sized loops. And the Ocean Pearls Cardigan is way-adorable. I love the ribbon tie closure. *I've been finding myself using my Grandmother's exclamations lately ... and I'm liking it. It's funny to see all the crazy looks people give you when they are used to you cursing all the time and you yell, "Oh, for Pete's sake!" instead of dropping the f-bomb. It's priceless. Not that I've stopped using the f-bomb ... I've just been mixing it up a little lately. And, for the record, I'm not 100% that Grandma said these things, but I'm 99% sure she did. My favorite expression I learned from her was "burr behind my eye" as in, "Well Grandpa couldn't stand that man. He was a burr behind Grandpa's eye." Oh, that Okie slang sings to my heart.